The 2018 Grade 6 Writing Competition came to a close last week, with awards given to 10 finalists and the three overall winners. Anna Warrican, of the Kingstown Preparatory School, placed first with her composition about âTravel Abroadâ. Arianna Chambers, of the Mary Hutchinson Primary School, placed second, with her story: âThe day I switched places with a cat,â while Ciara Antoine, of the Georgetown Government School, placed third with her article: âA fun place I enjoyedâ. According to Susanne Lewis, education officer for Language, Literacy and Communication, of the 45 registered schools, 41 students from 41 primary schools took part in the preliminaries in December. She explained that in both the preliminaries and the finals, students had to choose one topic from the four genres provided: descriptive, narrative, expository and persuasion. Furthermore, they were assessed on content, organization, language and mechanics and the 10 best went on to the finals. âMost students were comfortable with descriptive and the narrative pieces and I think that was similar with the finals,â Lewis said. The other finalists who received awards for participation were: Krista Williams â Troumaca Government School, Safiya Andrews â Calliaqua Anglican School, Azaria Commissiong â Windsor Primary School, Andrea Hoyte â Lowmans Leeward Anglican, Zedon Joseph â Layou Government School, Shamora Bulze â Fitz-Hughes Government School and She-Ann Samuel. Each participant received a gold medal. 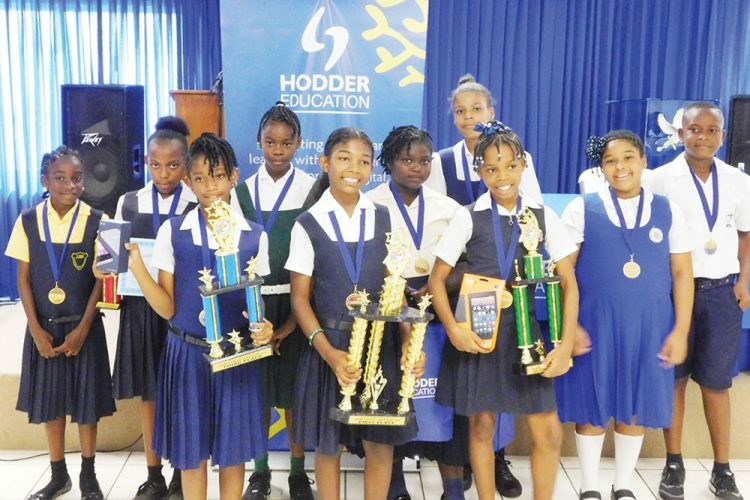 The three top winners received trophies for their schools, as well as individual prizes. The first placed winner received a Chrome book laptop, second received a Kindle Fire and third a cell phone. The event was a collaboration between the Ministry of Education and Hodder Education.